Add a small amount of water to starch and stir to dissolve the starch. Place pure mesona extract and water into the pot according to the ratio and heat up to 60~70 degrees , then add starch water , continue to stir until boiled. Switch to low heat after boiled and cook for about 2-3 minutes ( do not forget to continue stirring ) , then add sugar and turn off the heat. 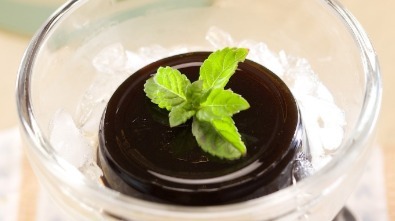 After the sugar has dissolved completey , you may then pour into favored containers and let it cool to form jelly. Please add the starch water in at temperature of around 60-70 degrees , as starch will not dissolve easily at temperature over 70 degrees , that may result in a failed product.